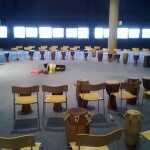 FOR ANY GROUP SIZE OF ANY KIND OR AGE! 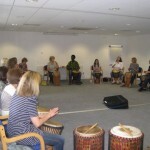 Group drumming can hugely benefit the interaction between members of any group! We each follow and lead a beat – like liquid, it passes amongst the group, rendering all participants as equal and thus comes the theory of how music unites us all, crosses boundaries of background, ethnicity, gender and more! But that’s not all…it’s highly addictive and enjoyable! 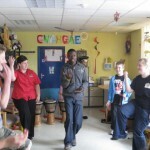 If there is one thing we can guarantee… it’s that every group member will enjoy the experience and leave it feeling in some way uplifted! 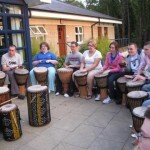 Activities can be tailored to suit the needs of specific groups and we can provide all the drums you need.